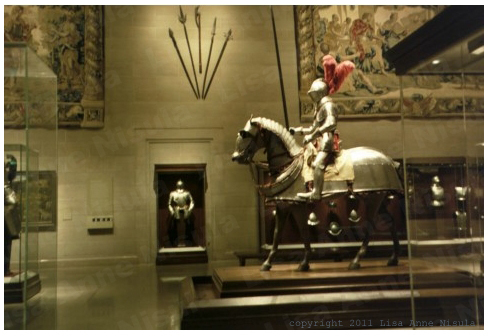 This is my favorite spot for research on knights and armor- the Armor Court at the Cleveland Museum of Art. The pictures here are old; the museum is in the middle of a renovation that seems like it’s been going on forever, but the bits that are done are gorgeous and I can’t wait to see the whole thing. As you can see, it’s exactly what it sounds like- an indoor courtyard filled with armor and tapestries, with a few crossbows thrown in. The story I’ve read a few times (don’t know if it’s true or legend) is that the founders of the museum were all Rockefeller millionaires, in other words, like the more recent Microsoft millionaires, people who weren’t born with much, but through their work with Rockefeller, became very rich and decided to give back (or, in many cases, were encouraged by wives to give back). A lot of cultural places in Cleveland were funded (and often still are funded) by trusts from this group, and the Art Museum is one. That’s all true; this is the bit I’m not sure on, but it makes a good story. The founders of the museum wanted it to be a place that people like their parents and grandparents, people who were not rich or highly educated, could visit and appreciate. For that reason, they wanted it to be free (Occasionally there are travelling exhibits that charge a fee, but the permanent collection is still free) and they added the armor court. Knights and armor are something the average person understands, and Cleveland was a steel town, so metal was something lots of residents understood. That made the armor approachable in a way that Renaissance painting or Greek sculpture wouldn’t be. 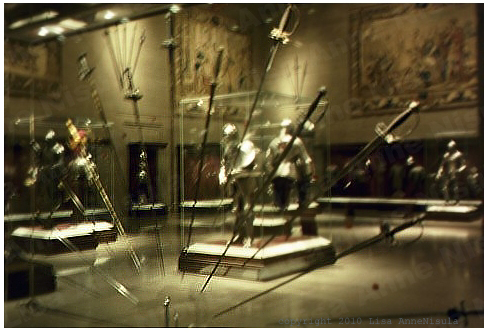 Whether or not that’s true, I remember going here in elementary school, and the knights, especially the fellow in full armor sitting on his horse, certainly made the museum fun and approachable for a bunch of ten-year-olds.